“Sweden will do whatever it takes” to end a wave of gang violence that has swept throughout the country, Prime Minister Stefan Lofven said on Wednesday, according to Reuters. The idea of getting the military involved in resolving the issue of ‘no-go’ zones within Sweden’s cities, where a large majority of migrants reside, was floated when Sweden’s political leaders debated how to combat problems with gang crime in the country. With the country’s center-right and right-wing media referring to the crisis as the ‘Sweden civil war,’ the police department’s inability to cope with more than 300 reported shootings last year seems to be going in their favor. The first Riksdag debate of 2018 between Sweden’s party leaders follows a string of deadly shootings in Malmo and Stockholm that had happened in recent weeks, as well as the death of a man from a hand grenade. During his opening statement at the debate, the Prime Minister spoke about shootings and gangs and identified them as one of the biggest problems Sweden is currently facing. He also added that more needs to be done to combat them including attacking their economic resources and a tightening of rules. “We’re going to continue to combat the forming of a parallel society. Today we need rules to be tightened, increasing control to cut out economic criminality,” he told the Riksdag, The Local reported. Opposition Moderate leader Ulf Kristersson followed suit and demanded tougher legislation to fight crime and avoid the possibility of a civil war in Sweden. “ The state should take back control. This is not a negotiation,” he said at the debate. Jimmie Åkesson, the leader of the far-right Sweden Democrats, was more extreme in his address, saying that his party wants to “declare war” on organized crime. Åkesson also suggested using military help to support the police could be an efficient way to combat these issues. With law and order now being a major issue in the upcoming parliamentary elections in September, it’s no wonder that Lofven, the leader of-of Sweden’s center-left Social Democratic Party, had taken a tough stance on the rising crime rates that could lead to a Sweden civil war. When contacted by The Local for clarification, a spokesperson for Lofven said that the Prime Minister was not saying he was prepared to get the military involved, but that “he is ready to do what is required” to get rid of gang criminality. “The military is not one of the first options, but we will look at a number of other measures. If that’s not enough, the PM does not want to speculate what comes after,” Löfven’s press secretary Jonatan Holst wrote according to The Local. Reuters reported that in response to the rising crime rates, especially within the secluded, no-go zones in suburbs of Sweden cities, the government has promised to increase police funding for an extra $880 million through 2020. Apart from the increase in funding, the government also plans to tackle Sweden’s civil war with multiple other measures, including toughening laws on gun crimes and making it easier for the police to monitor private phone calls and emails. “This is the new Sweden; the new, exciting dynamic, multicultural paradise that so many here in this assembly … have fought to create for so many years,” Sweden Democrat leader Jimmie Akesson sarcastically said during his address to the parliament. Akesson referred to the high numbers of migrants from Central and North Africa, as well as Syria, that have arrived in Sweden thanks to the country’s liberal immigration laws and generous welfare system. In the midst of a heated parliamentary election campaign, Sweden’s government is said to be preparing to issue leaflets to 4.7 million households amid growing fears of war. A Civil Contingencies Agency spokesperson told CNN that the pamphlet is partly prompted by the “security situation in our neighborhood.” The spokesperson is said to be referring to the Baltic area, which has seen an increase in Russian military activity. Marinette Nyh Radebo, a spokesperson for the Swedish Ministry of Defense, told CNN last year that the “illegal annexation of Crimea and the ongoing conflict in Ukraine” is part of the reason why Sweden has stepped up its defensive efforts. The pamphlet scheduled to be released in early spring is said to be titled “If Crisis or War Comes,” and will advise people on how to take part in the defense of the country, as well as instruct them on how to prepare their homes and what to do in the case of evacuation. The manual, which is based on a pamphlet first sent out during World War II, should also contain information on how to react in the case of a terror attack or a national disaster. No government spokesperson said that the pamphlet had any connections to Sweden’s civil war threat that had been circulating throughout the media. “All of society needs to be prepared for conflict, not just the military. We haven’t been using words such as total defense or high alert for 25 to 30 years or more. So the knowledge among citizens is very low,” Christina Andersson, head of the pamphlet project at the Swedish Civil Contingencies Agency, told the Financial Times. The Swedish government, along with the organizations that are tasked with working on the release of the pamphlet, says that it’s nothing more than a precaution. The timing, however, suggests that there’s a pretty destabilizing period waiting up ahead. 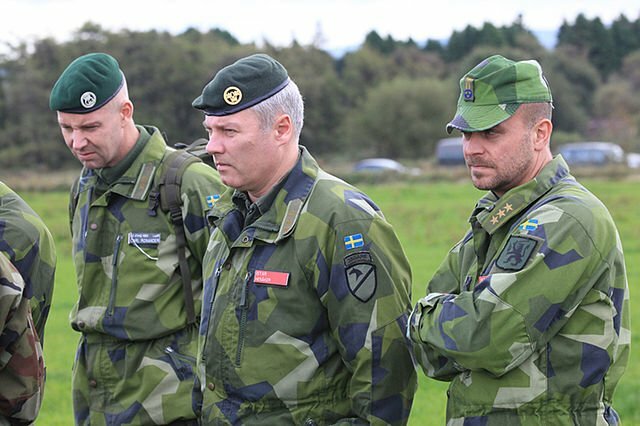 While the increase in Russian military presence in the Baltic region cannot be disputed, many people in Sweden feel that Russia is used as a scapegoat by both the government and the state-run media. With no direct or open disputes between Russia and Sweden, and various Swedish ministers and government spokespersons referring to a threat the country “perceives” is coming from Kremlin, saying that there’s more to the Sweden civil war threat might not be that far removed from the truth.